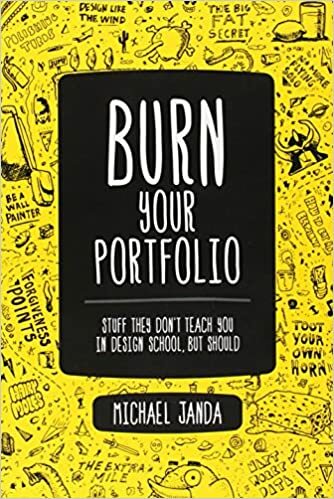 Michael Janda wrote Burn Your Portfolio with graphic designers in mind, but there is a lot of wisdom that can be applied to any career in any industry. Of course, he is not actually recommending that you burn your portfolio, but that there is more to being a graphic designer or web developer than they can teach you in a four-year degree or three-month code school. If you are considering freelancing after code school, Janda can help you avoid a lot of common mistakes. Janda attributes his success to his behaviour, work ethic, and social prowess, not his exceptional design skills. He even admits that his design skills are just above average. What keeps the lights on at his agency is dedication to client happiness, an attitude of openness, and a ton of learning from mistakes. You never know where your next job offer or contract is going to come from. Janda was able to trace 90% of his clients back to one friendly interaction he had with an intern he worked with briefly one summer. You may be scrambling to hit your 4pm deadline, completely unaware that there is someone in an earlier timezone waiting for your part so that they can do theirs. Delivering your commitments first thing in the morning not only pushes the scramble to the night before, but it gives the other end time for feedback, questions, last-minute changes, or ample patting on the back. Large projects, like eating an elephant, can’t be done all in one sitting. Break large projects down into actionable bite-sized pieces, and leave plenty of time for digestion. Your stomach can only hold about 32 ounces at a time, and you can only do so much work in a day. Web design and graphic design industries have a lot in common, including a fast pace of change. Designs from 2 years ago are beginning to show their age, and you can’t rely on your current skill set to be relevant in the next 5 to 10 years. Take some time to identify where you want to be professionally in 2 years. Whether you think about it or not, you will be looking for a change. Whether for more pay or more responsibility, start closing your skills gap now. Do what you can to stay current with industry standards. Last year, Angular was the front-end technology that was going to take over the world. This year it’s React. What will it be next year? What are you doing to teach yourself the skills you will need then? Code reviews can be difficult, especially if you identify too much with your code. You are not your code, and whether you are a 10-year veteran or just starting your career, seek out criticism whenever and wherever you can find it. It will improve your code, your designs, and your career. Even people you hate. Find that one thing that they do better than you and learn it from them. Janda recommends taking a look around your office and to identify one attribute from each of them that you would like to incorporate into your life. In a section titled “Two Ears, One Mouth,” Janda shares his philosophy on communication. It can be summed up as [often, friendly, perfect]. Frequent updates are key to keeping clients calm. If a client gives you the thumbs-up and then does not hear from you until the end of the project, they are going to wonder and worry. Keep panic at bay by giving weekly and ad hoc updates as milestones are hit and approached. Record verbal decisions with written follow-up to make sure everyone is on the same page. Memory is a tricky thing, and you may leave a meeting with an entirely different impression than your client intended to give. If you have made a verbal agreement, or come to a decision in a meeting, take a moment to follow up afterwards with an email that shares your understanding of what transpired. You will have a written record of what was decided, and your client will have the opportunity to correct any misapprehensions. It is easy to misinterpret tone in an email. If you do not set it deliberately, your reader will inject their own emotional state. Janda shares his 100%-no-fail template to keeping email communication easy, breezy, and professional. Friendly comment: Hope you are enjoying the gorgeous early-spring weather! I was impressed by your website and hope to one day join your team! Get to the point: Please see the attached resume in response to your advertisement for a web developer. Friendly comment: It sounds like an exciting opportunity! Framing your communication between friendly comments ensures that the content will be read with a friendly tone. Take away the friendly comments and you sound like a bot. Never put anything in writing that you would not want a client to read. That includes glib filler text, nicknames, or unflattering categorization. No matter how careful you are, someone will see it, and you can say goodbye to your reputation for professionalism. If you can, get a coworker to proofread your communication before you hit Send. The writer’s brain will see past typos and grammatical errors, but the reader’s won’t. If you are trying your hand at freelancing, “Section 5: Mind Your Business” is gold from start to finish. Janda talks about how to set a fair price on your work (hint: it is about value, not about time invested), how to avoid getting burned by undocumented work, how to prepare for disaster, and how to deal with the stress of irregular pay. How do you handle spikes in demand? Have a list of reliable freelancers at the ready for when you have more work than you can handle. How do you know when you are succeeding? How do you get to know the cadence of your own business? Keep metrics on everything. How do you pitch your business? Make a capabilities presentation. Burn Your Portfolio is a how-to-succeed-in-life sort of manual. Nothing but industry experience will help you avoid the common mistakes we all make early in our careers, but putting Janda’s systems in place early will likely save you from at least a few hard lessons.